Willadean Price, age 88, passed away March 25, 2019. She was born at home on July 2, 1930, to Willis and Margaret Baum in Antioch, Missouri. She was raised in Antioch and Kahoka, Missouri and graduated from Kahoka High School in 1948. She married her husband of 53 years, Basil L. Price, May 15, 1949. 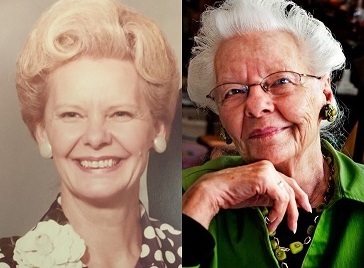 She spent most of her adult life as a wife, mother, and homemaker and then worked for Sears until she retired in 1991. Willadean is preceded in death by her husband Basil, son Johnne Price, parents Willis and Margaret Baum, sister Annice Gibbs, and brothers Frank and Leland Baum. She is survived by brother Melvin and his wife Maxine, sister-in-law Jane Baum, son David Price, daughters Sherre Paris and Vicke Evans and son-in-law Mike Evans, daughter-in-law Sandy Clawson, grandchildren Eleanore Price, Carmen McFarlin, Aaron Paris, Joseph Evans, Willie Evans, Tim Evans, Phillip Paris, Brandon Paris, Evie Kjelstrom, nieces and nephews, and numerous great-grandchildren and great nieces and nephews. Willa was born in rural Missouri, the third of five children, with two older brothers and then a younger sister and brother. She and her siblings grew up in a two room house lit at night by kerosene lantern and she remembered falling asleep to her father listening to the FDR fireside chats on their radio. She rose with her father early in the morning and began baking the bread for the family from the age of nine. She spent many happy childhood days at the farms of both maternal and paternal grandparents and attended a rural one-room school house until the eighth grade. She then went to high school in Kahoka, Missouri, where she loved to play basketball. Growing up during the Great Depression, she had strong memories of having a gray skirt and one red sweater that she would wear buttoned down the front one day and down the back the next. She worked during high school at the large department store in Kahoka where she learned all about fine clothes, fabrics, perfumes and men’s colognes. After she graduated from high school, she worked at the Chevrolet dealership where her desk faced the big display window that looked out on the town square. There was a handsome young man with a wave in his hair who walked by the window every day and she noticed he wore a burgundy corduroy jacket. He was recently returned from service in the U.S. Navy during the WWII Pacific Theater. They would keep company with other young people at the local coffee shop and were soon married. They lived in Kahoka for a few years but then went on adventures to live in Arizona and California until they returned to the Midwest and settled in a small town in Iowa. Basil, a master mechanic, owned the local Standard Service Station and body shop while he and Willa raised their family of three children. Then adventure struck again when they moved in 1963 to Corpus Christi, Texas, a long, hot way from Iowa, and where Willa felt she had followed her husband to a different planet. But Corpus Christi became where their last child, David, was born, Basil found good work at the Naval Base, and they bought a small frame house where they lived until their deaths. It was here in Corpus that Willa discovered the marvelous wonder of garage sales and could combine her gifts for thrift, provision for her family and love of beautiful things. She never failed to be amazed that she could buy a Calvin Klein silk blouse for 10 cents, books and artwork, dishes, jewelry, antique furniture and once, enough brand new grass green Ethan Allen carpet to re-carpet the entire house well within the budget. When she eventually went to work at Sears, she relished being able to extravagantly change clothes as many times as she wanted before she decided what to wear, complete with matching accessories, and still have less than $10.00 on her body. And she always looked stunningly lovely. Willa was a hard working, diligent and thrifty woman who could garden, raise beautiful plants and flowers, wallpaper and/or paint a house, and refinish and upholster furniture. She sewed her daughters’ clothes from the time they were small until they were old enough for elegant prom dresses with matching purses and stoles, and then wedding gowns. She decorated the family home in that rare way that was lovely, warm, comfortable and welcoming. She made the best yeast rolls, pot roast and chocolate pies in the world, but never lost her love of baloney sandwiches. Basil, in admiration of her abilities as a thrifty homemaker, would say she could spread one strawberry from the jar of jam over 4 pieces of toast. Willa, though possessed of no more education than high school graduation from a small town school, evidenced an undying intellectual curiosity and love of history, good literature and art throughout her life. She was the family visual historian who covered the walls of the den salon style – family photos from floor to ceiling and wall to wall. She enjoyed good movies, reading non-fiction and poetry. Even after her first stroke, she could still quote Bryant’s Thanatopsis, learned in high school, and after Basil’s passing, Auden’s Funeral Blues. She was a good listener and someone everyone who knew her loved to talk to about anything and everything. She was unfailingly a kind, generous, hospitable, person possessed of great-hearted and spontaneous love for her family and whomever her family loved. She was a person of courage who suffered the sudden tragic death of her middle son when he was 37 and, in her later years when most her age were well-retired, took on the challenge of raising her premature and special needs granddaughter. As with many other challenges she faced and overcame, she succeeded in this one and Eleanore is now a flourishing 20 years of age. Willadean’s home has continued to be the family center from the time Willa and Basil bought it until now, 55 years later. No matter how far extended family has roamed, we have all made countless pilgrimages for any and all holidays and for no particular reason except to be in this house with the love we found waiting there. Where there was happy and relaxed clutter of things to see and do that made it easy for small children to be themselves and a big window filled with light catchers that would splash rainbows all around the room in the late afternoon sun. There was always the necessity to begin leaving at least an hour before we really needed to leave because the good conversations and hugs would continue out the driveway until we drove off with her standing there waving good bye. And now, beyond anyone’s control, she has driven off, and with heartbreak, we must all wave good-bye to her. Willadean, Mom, Great Nonnie, Grandma, Aunt Willie, we thank you for all you were and gave. God speed, and we will all love you forever. An inurnment will be held at 2:30 p.m. on Friday, April 5, 2019 at Seaside Memorial Park.